I'm so happy that spring is almost here! Christine joining you today and playing with the Spring Garden collection got me right in the mood for flowers and sunshine and all the fun that comes with Spring! 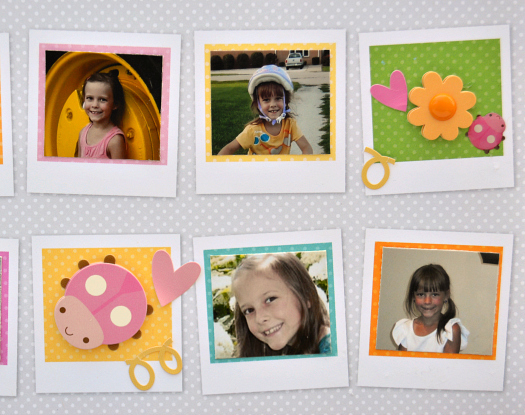 As a mom to four kids I am always on the lookout for ways to knock out a stack of pictures quickly. But I also want my layouts to look good and tell the story I want to share. Enter the polaroid paper from the Spring Garden collection. 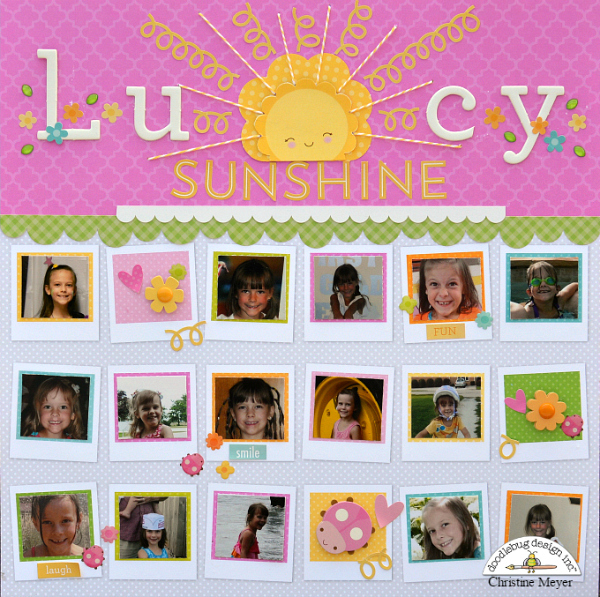 A great way to get a whole bunch of those little pictures onto a layout in a pretty and trendy setup! I keep a stack of pictures organized for each of my kids and pull from it when I am ready to tell the story. But here's the deal - there are a lot of cute faces that have already had the story told! There are also a lot of pictures that the faces are just too small to work on their own layout. This paper was the perfect solution. I just went through my stack and started pulling out pictures that I knew would fit. I had to be able to fit the face in a 1 1/4" X 1 1/8". I couldn't believe how many I had that worked! So I sorted through and used only ones she was smiling in and only ones that had decent lighting. Initially I filled up every space but that was a little overwhelming. I ended up leaving an empty one on each line and then filling those with Doodle-Pops, Fancy Frills, Sprinkles, and Cardstock Stickers! I cut the pictures to the size I did so that I could leave some color in the background of each. I think that adds to the spring feel don't you!?! I could have easily have filled the whole paper with pictures but I knew I wanted someplace for a title. So I added a monochromatic patterned paper to the top of the page. I wanted to use the word "sunshine" because I thought it fit with her smile! 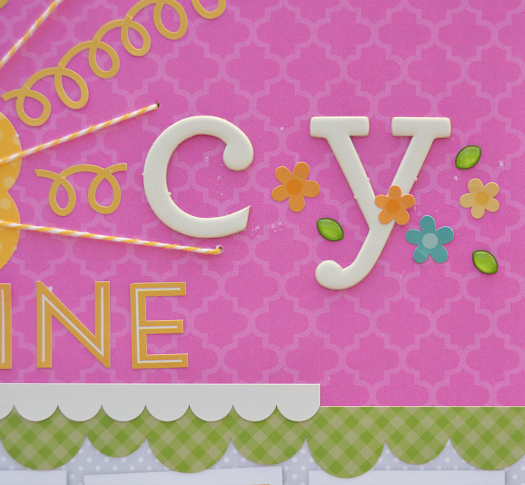 On top of the word I added a sunshine on top of one of the die cut flowers. 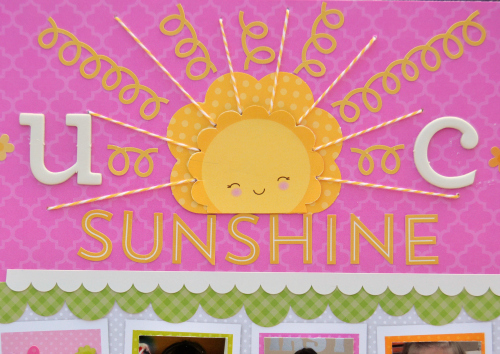 I then used Chunky Doodle Twine and Fancy Frills to create sun rays. I surrounded the sunshine with my daughter's name spelled out in the Chippers Alphabet Stickers. I also added some cardstock stickers and sprinkles to the title to add a bit more color. So who's ready to get a whole bunch of pictures on a layout now?!? OMG What a Fabulous and oh so creative scrapping idea...I've never seen this done before...I'm a die hard scrapper and print all my own pics 1000's a year and have printed them tiny and use the TH film strip die allot....but you idea is awesome....I so am going to be doing this you are so right so many awesome pics and can only fit so many on a layout....You've blew me away when I saw your layout..it's a Genius Scrappin' idea. YOU so ROCK!! Christine I love everything about this page!